Skz868992: Any more ’19 commits prior to NSD? AS: I think you could see one guys pop for Florida in the 2019 class before signing day but it’s a not a sure thing. Most guys still have visits to take so that’s why they’re waiting. AS: Moore I would put at 60% right now. Elam 70% and the only reason it isn’t higher is because he still has a Georgia visit remaining. With Vilbert, I would say 30% and only that high because Penn State could be facing a numbers crunch. Henry, I would say 50% just because I think the seven signees on the line could scare him off once he sees other teams that are in bigger need of linemen but Henry’s parents really liked Florida. Manuel, is committed so no percentage needed there. Brooks is 50% right now but he’s listening to everyone. Davis is a little high at 55% but Ohio State and Miami are still in the mix. UFMBA14: Who are the big defensive tackles and safeties for 2020 and who do we have the best shot with? AS: At defensive tackle, Florida already has Gervon Dexter committed there but McKinnley Jackson and Tim Smith are both big names at the position as well. Florida has some work to do with those guys but both guys had Florida in their list of top schools already and more offers will go out to other guys there. At safety, the Gators have Rashad Torrence already committed to them and they offered the number one safety in the country last week in RJ Mickens. Also Oregon commit Avantae Williams who projects at safety at the next level says he’s going to visit Florida this spring and he was high school teammates with Dionte Marks. UFMBA14: Amongst recruits, what are you hearing about the Florida brand and Mullen and Co, Georgia with Smart, and FSU with Taggart? I know what the opinions are on the board but I want to know what recruits are saying. AS: The Florida brand is definitely back and guys are definitely paying attention to the Gators and what Dan Mullen is doing both on and off the field. I believe that has shown in the number of early commitments the Gators have received from underclassmen and big name underclassmen. Recruits are aware of the Gators now and it’s not just an instate thing either, recruits across the country are paying attention to Florida. Ol2ange: What are the chances of Diwun Black qualifying? What are the chances of Arjei Henderson qualifying? Will UF take backup plans at those positions if 1 or both do not qualify? If so, can you name names who those players might be? 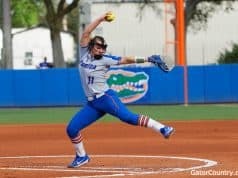 AS: Both Black and Henderson know that they have work to do in the classroom still and the Gators have explained to both guys what they have to do in order to be ready to go this summer. Both guys have a chance but we won’t know a final answer until early summer. As far as backup plans go, Florida isn’t really recruiting anyone else at linebacker and at receiver they’re fine with the guys who signed early already. They did visit George Pickens but the chances with him are slim. Baileyboy1223: Smith Vilbert looks to be a diamond in the rough do we beat out Penn state for him also do you think we get an unofficial from Nathan Pickering? AS: It’s going to be very tough to beat out Penn State for Vilbert because of the distance from home and the relationship he and his family have with the staff at Penn State. The Gators have made up some ground on him but it was a little too late there. On Pickering, I don’t see him taking an unofficial to Florida at this time, he has other officials lined up already. TheGator: Any chance of a surprise flip before or on NSD? 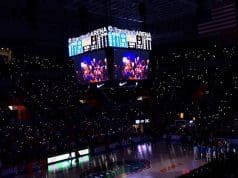 AS: At this point of writing this, I don’t think you see a surprise on signing day, the guys that Florida is after have visited and you know about them already. Now that could change if things start to go south with someone and the Gators decide they have someone else that they want to replace that person. 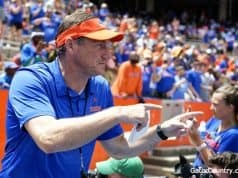 Macbgator: Any more 2019 recruits that might make an official visit before signing day?? AS: FSU commit Travis Jay is still a possibility that he visits but it’s slim that he does because he has basketball games on Saturday’s and is pretty locked in with the Noles. You still have commit Diwun Black to visit as well and that should happen next weekend. Spurfelow314: Any news on George Pickens? If he visits what are our chances with him? AS: Slim right now would be the chance that he visits so the Gators chances are even slimmer that he would choose Florida. Auburn has been the team for Pickens for a long time and he’s close with quarterback signee Bo Nix. Right now Georgia is running second for him but I don’t even like their chances of flipping him. UF_HOSS: Best guess on a interior defensive line…….will we get one? AS: I feel pretty good in saying that Florida will get one guy and I think right now that guy would be Charles Moore but we have to watch to see if he makes anymore trips and if he visits Tennessee. Tennessee and Auburn are definitely still in the mix. Johnagator: Looks like the hay is mostly in the barn for ‘19. Are the coaches spending more time on ‘20, and ‘21? AS: Yes, the coaches are visiting mostly 2020 and 2021 prospects during the month of January. They will visit the few guys remaining in 2019 as well but most of the work is on future classes and offering guys in those classes. Graylon: Do you see Kendrick Bingley Jones committing back to us in the future? AS: Right now, I lean towards no, he’s going to visit South Carolina on Saturday and they wouldn’t surprise me as his next pick. 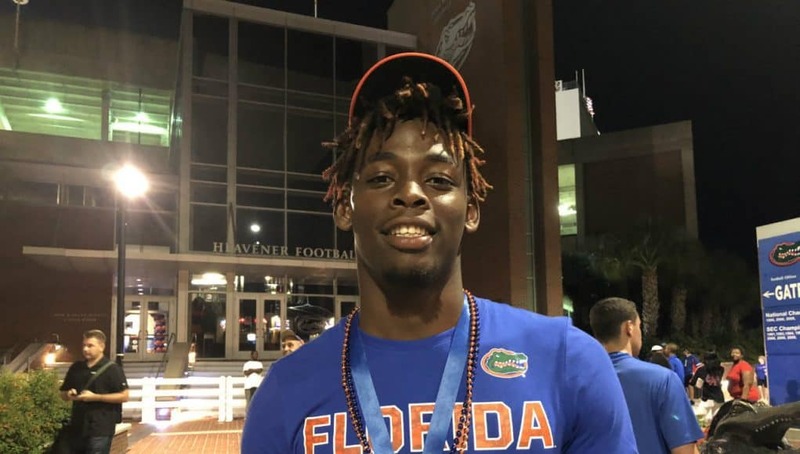 Gator_nica: Who are the top players in Florida for 2020? AS: The state of Florida is pretty loaded for 2020 but here are the top five players in the state for me next year. Receivers Marcus Rosemy of St. Thomas, Leonard Manuel, running back Demarkcus Bowman, defensive back Fred Davis and then offensive lineman Jalen Rivers. Those five guys are difference makers at the next level. Keyvone Lee is also right up there for me as well as I think he’s a special player. Juggernautz: Can you provide a list of which coaches are recruiting what area(s) for us? AS: Out of state, the coaches recruit their position for the most part with the except of some coaches who have ties to certain states will recruit that state. For example, Ron English recruits the state of California and west coast more than others and Greg Knox is big in the state of Mississippi. Juggernautz: Any new news on Mark-Antony Richards? AS: Nothing really new on Richards except that Florida visited him on Wednesday night and are right there with Auburn for him. This is a two team battle between the Gators and Tigers right now with both of them pretty even at this point. In-home visits will decide this one as the Gators have really soared up for Richards this year. Dhainer24: Where do the Gator’s coaches project Keyvone Lee to play? I seem to remember back when he committed that linebacker was mentioned, but recently a couple of posters who seem pretty well informed have said he could be one of the best RB in the country. I follow recruiting quite closely, and I had no idea he was that good of a running back. If we get Demarkcus Bowman, does that change where Lee plays? Is he as good as Bowman? AS: First off, Lee is a tremendous athlete and one of the top players in the country for 2020 so he can play multiple positions at the next level but it looks like he will start off at running back for Florida. Florida really needs two running backs next year after only taking one this year so he and Bowman would make a great duo. As far as who’s better, that’s a tough one as I think both are elite players.